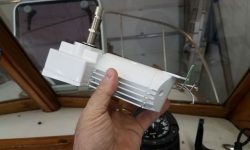 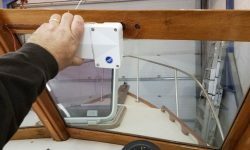 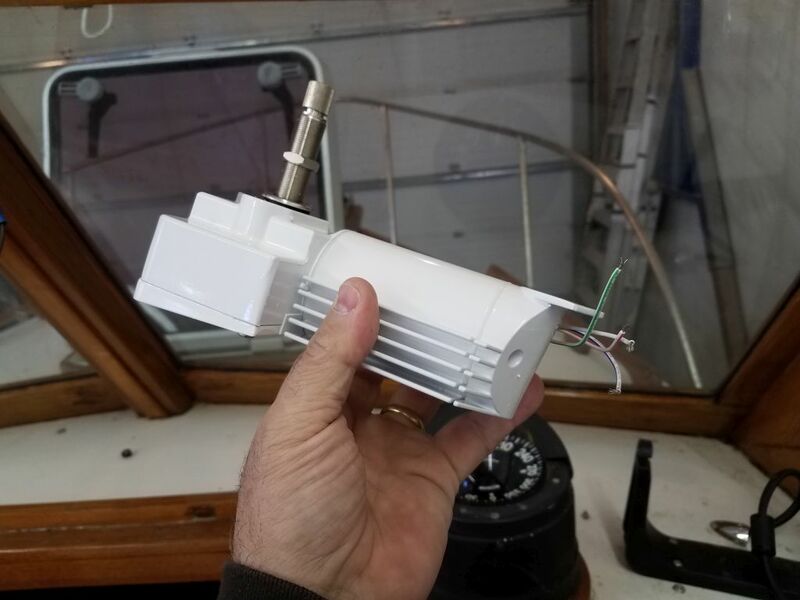 I spent some time with a new wiper motor I’d bought, mocking it up against the windshield, but it seemed bulky and the owner and I discussed the pros and cons and how best to address the original complaint about wiper performance. 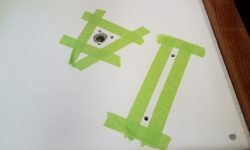 For the moment, I set the new items aside and looked into replacement arms and blades for the existing motor once more. 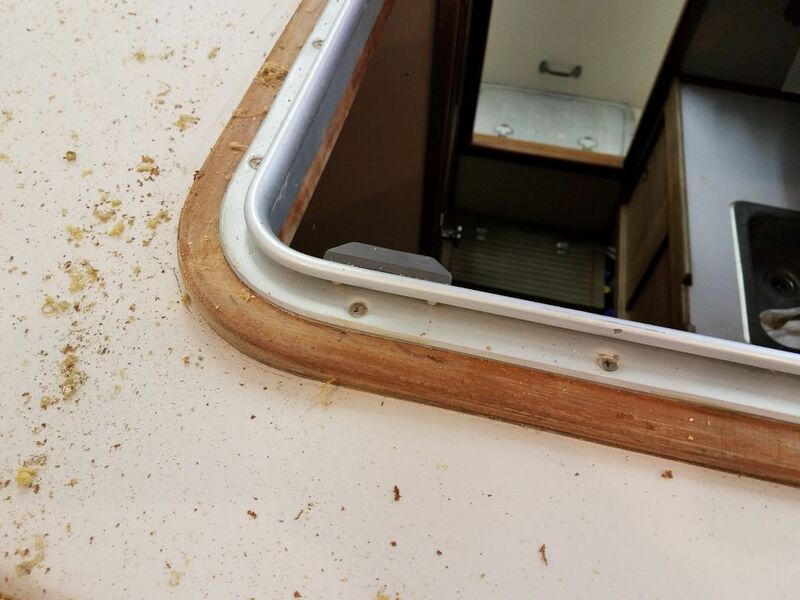 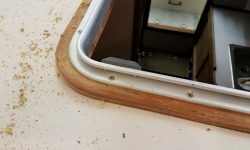 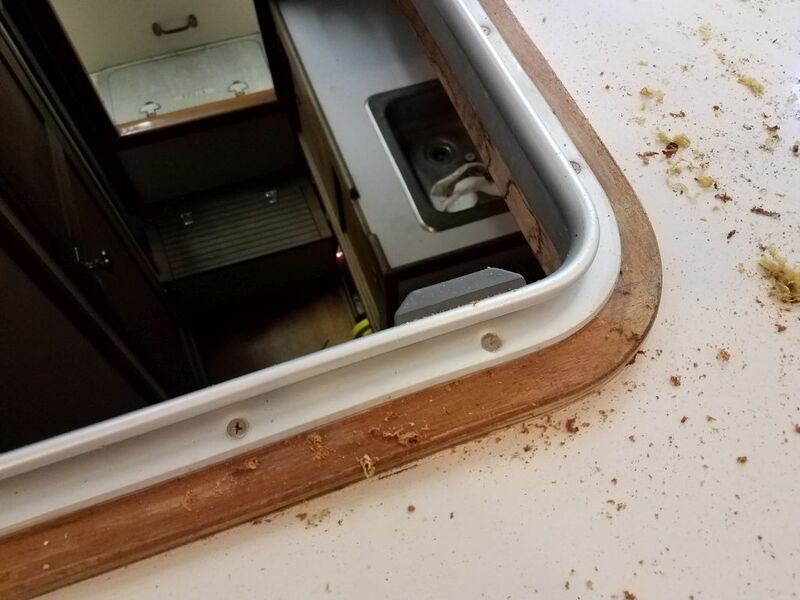 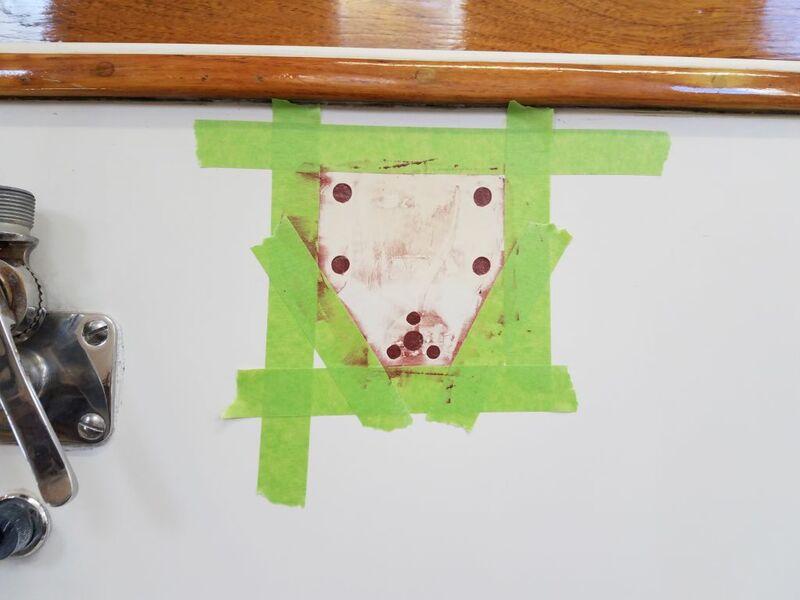 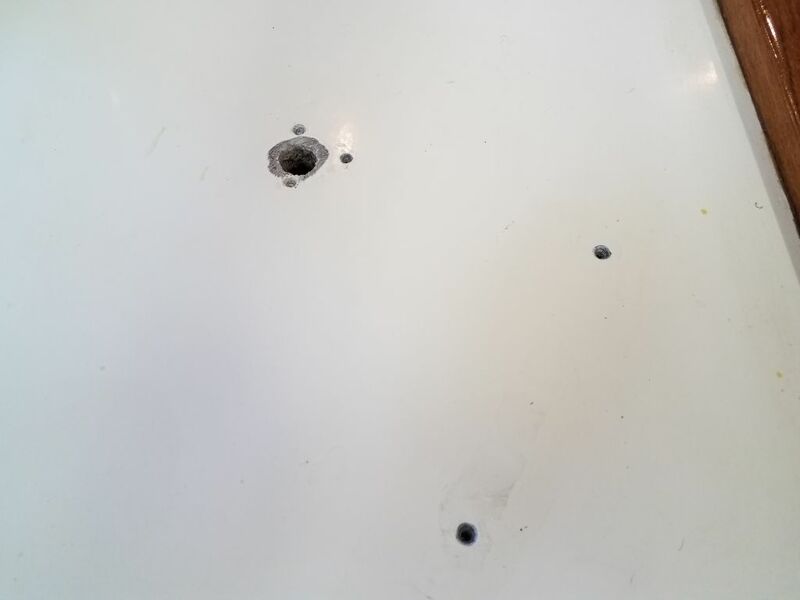 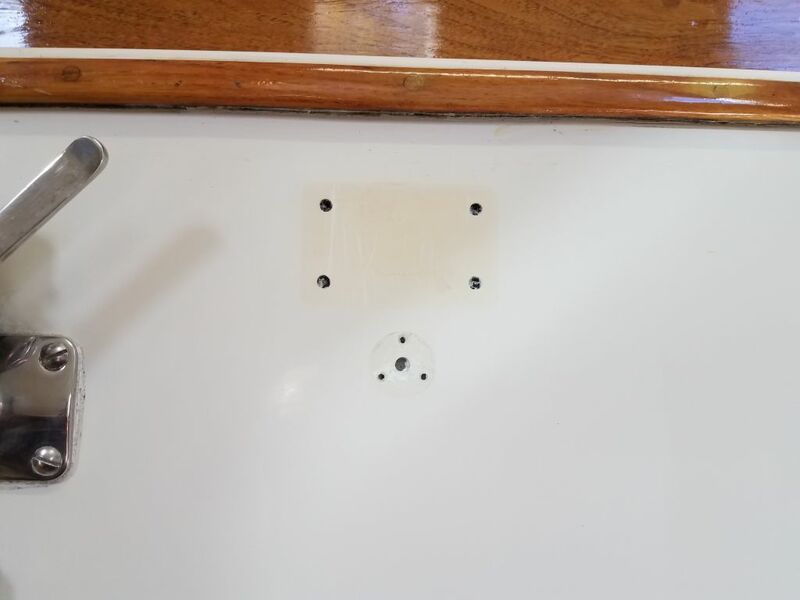 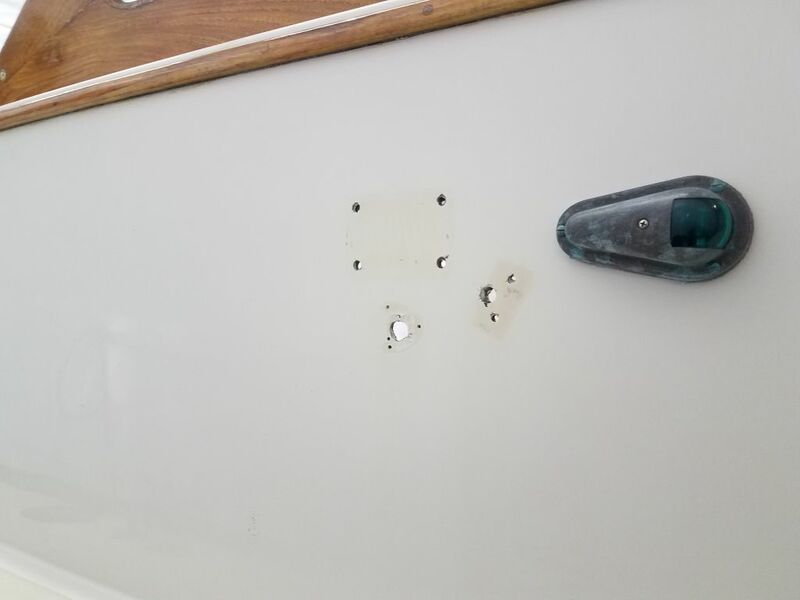 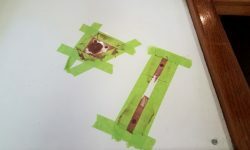 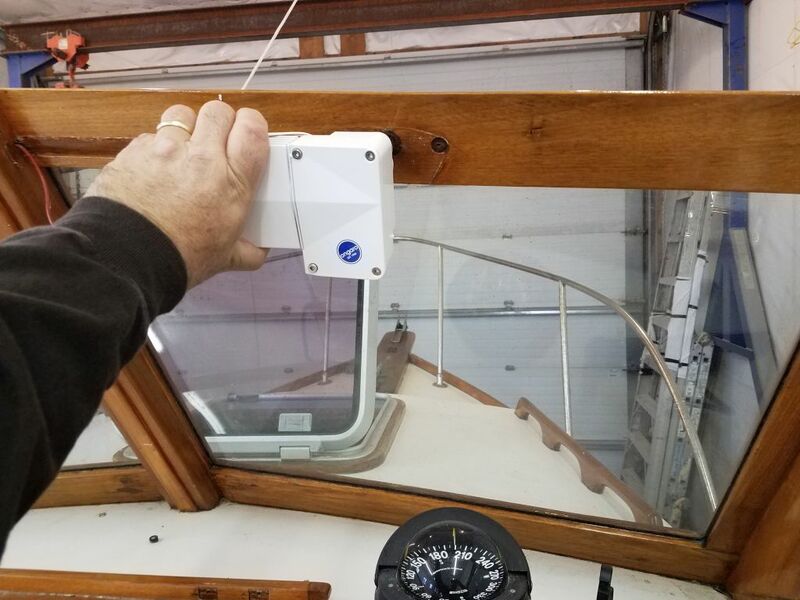 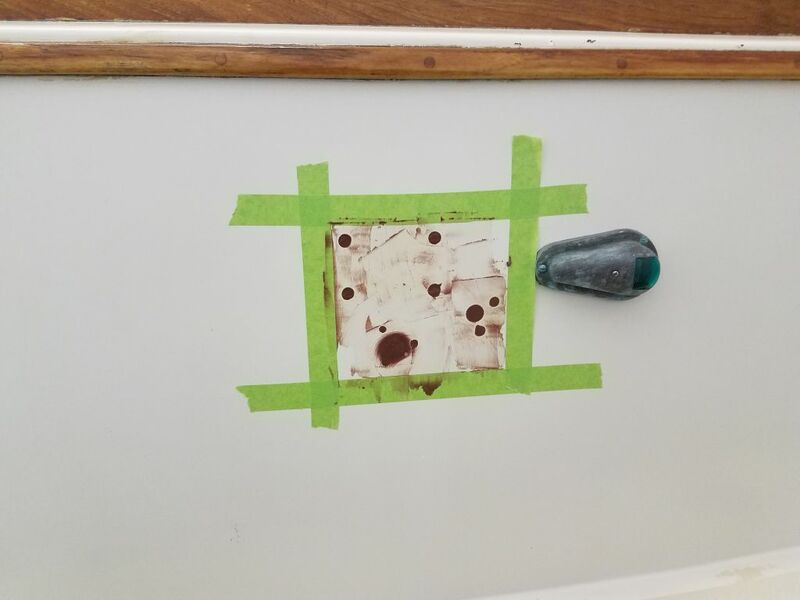 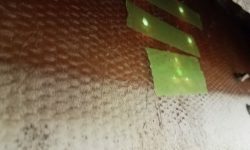 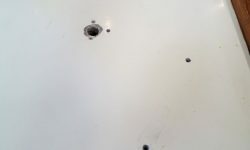 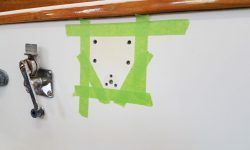 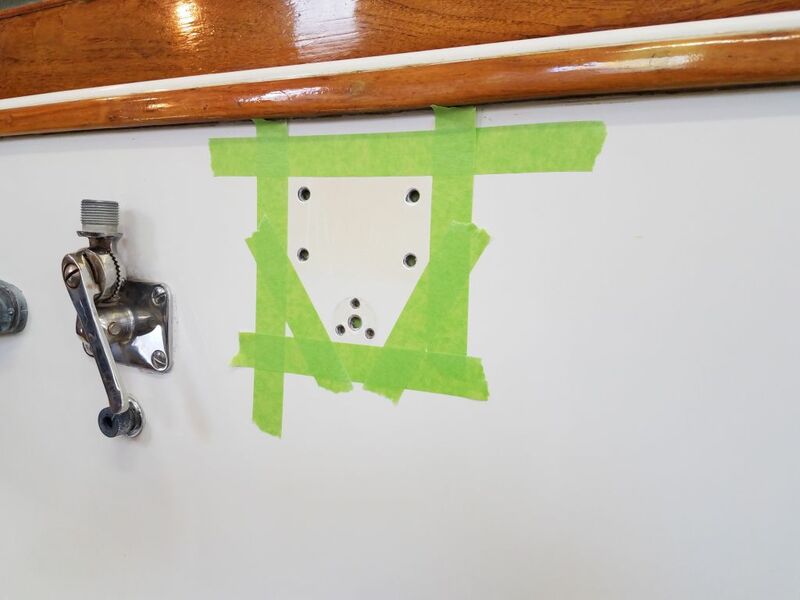 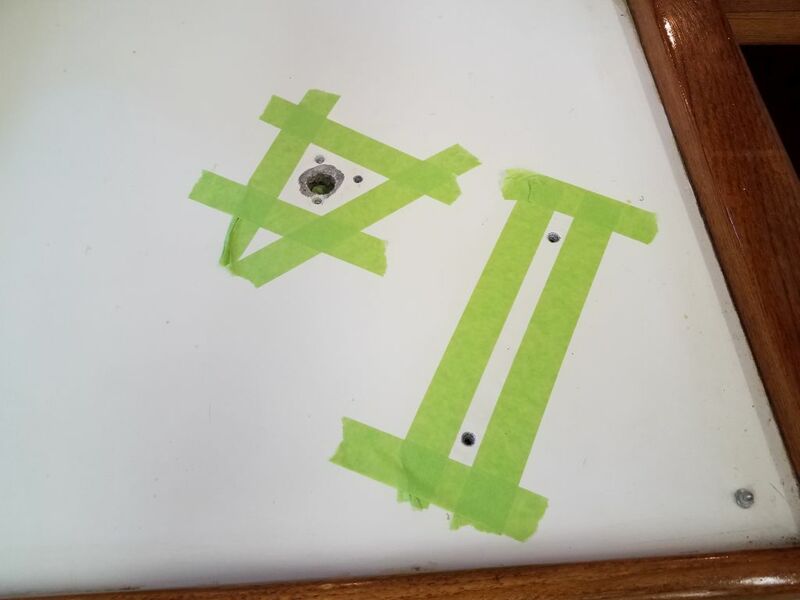 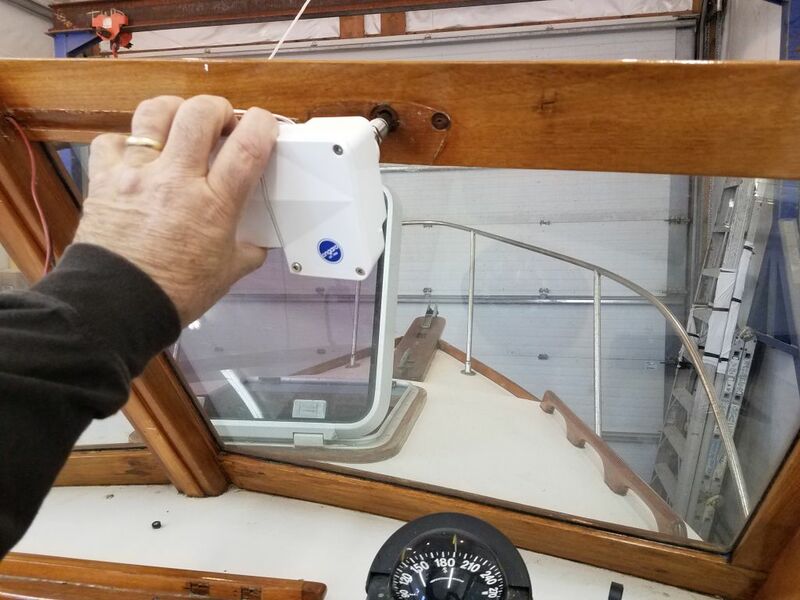 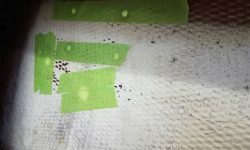 The removal of the unused antennae and horn brackets from the sides of the cabin left holes behind, and now it was time to begin the repair and patching of these holes. 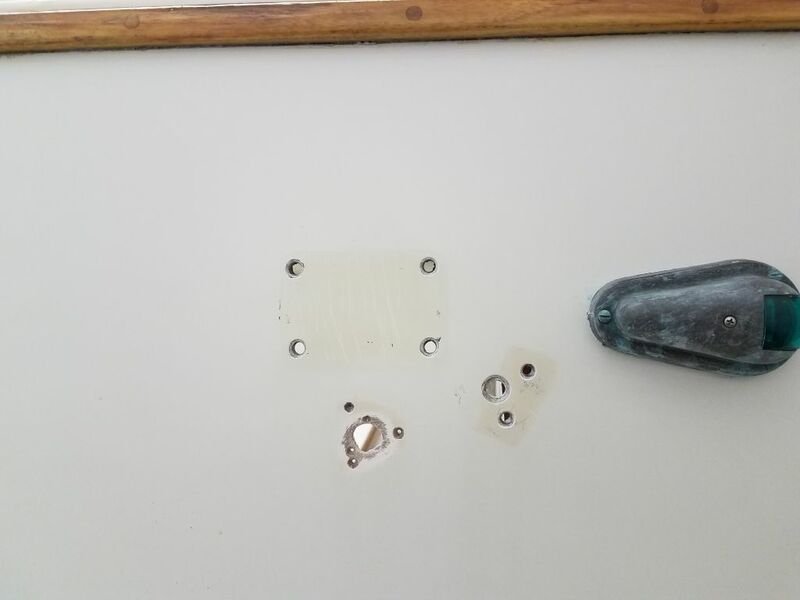 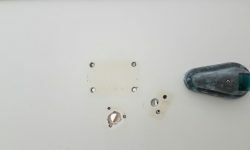 There were three additional holes in the port side of the dashboard, where an old piece of electronics had once stood, and I planned to fill and patch these holes as well. 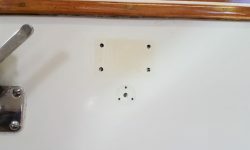 I prepared the holes for filling by reaming them out with a countersink (smaller holes) or a small grinding disc to provide a better bond with epoxy filler, then, after final preparations, including cleaning and masking the visible side, and masking over the holes from the back side, I installed epoxy filler in the holes, troweling it flush. 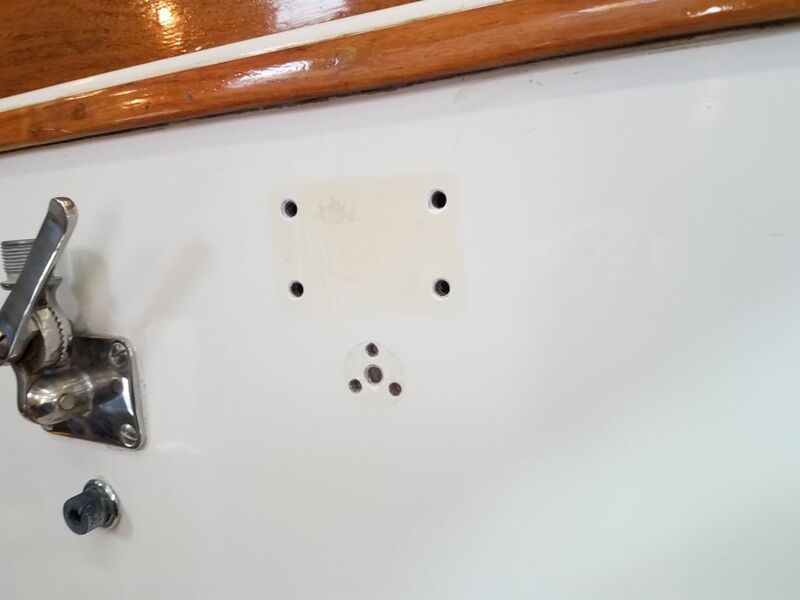 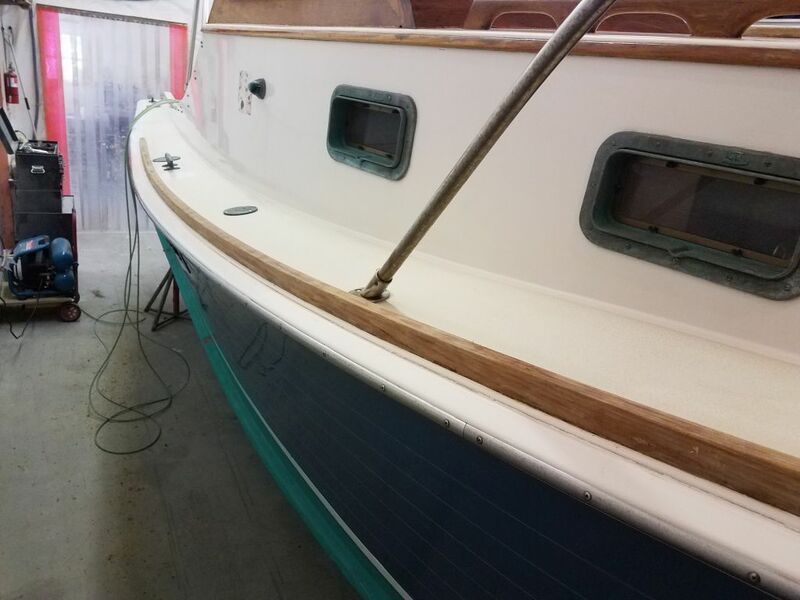 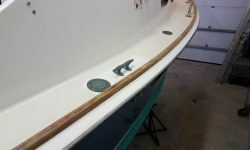 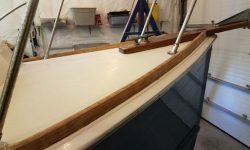 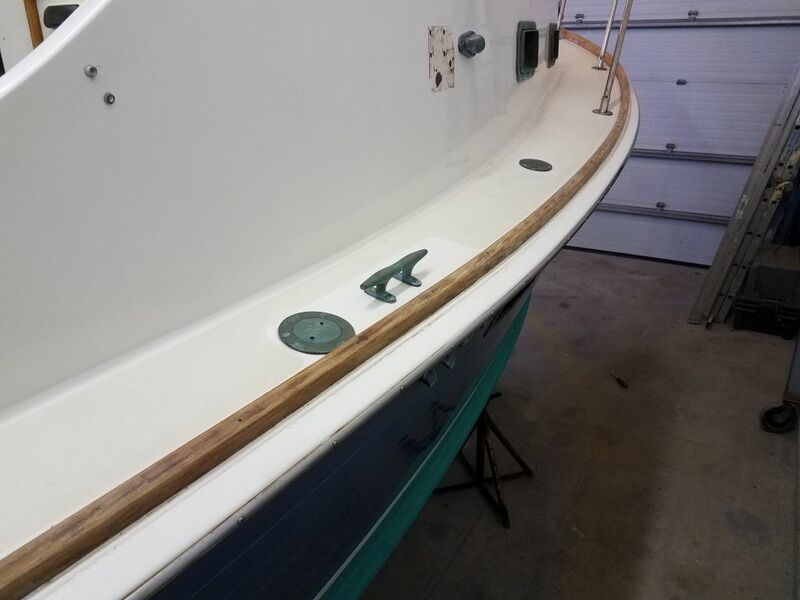 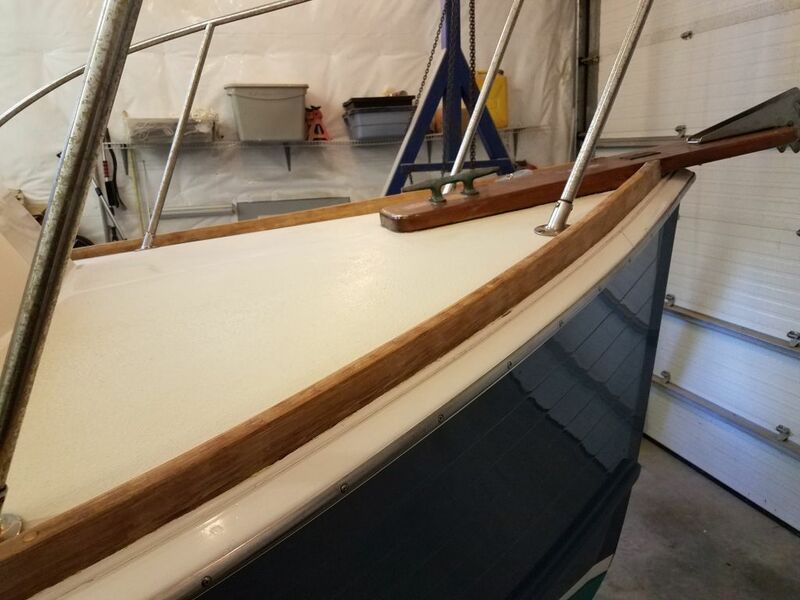 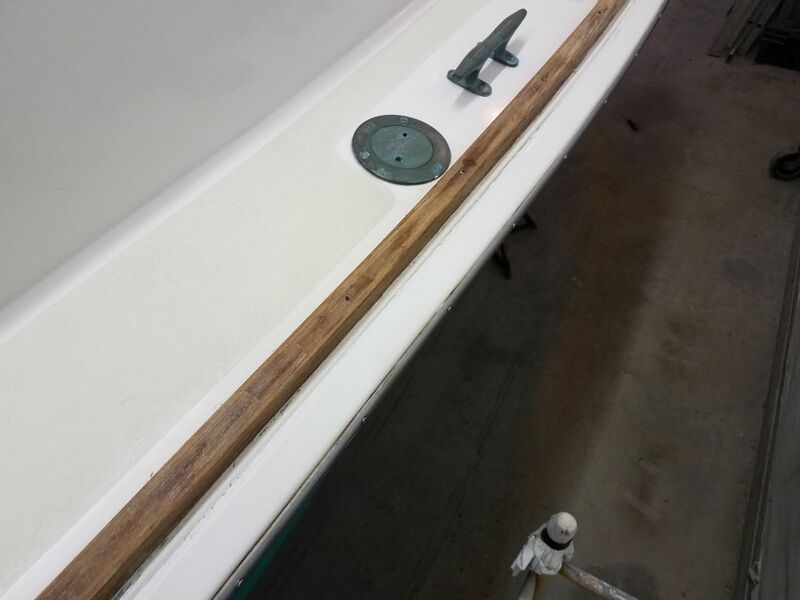 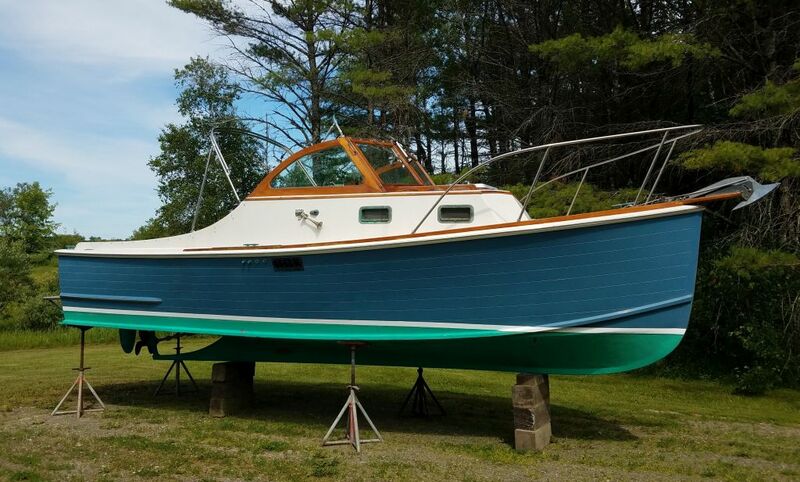 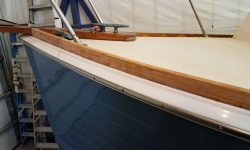 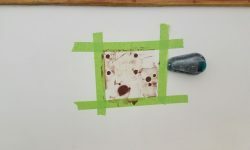 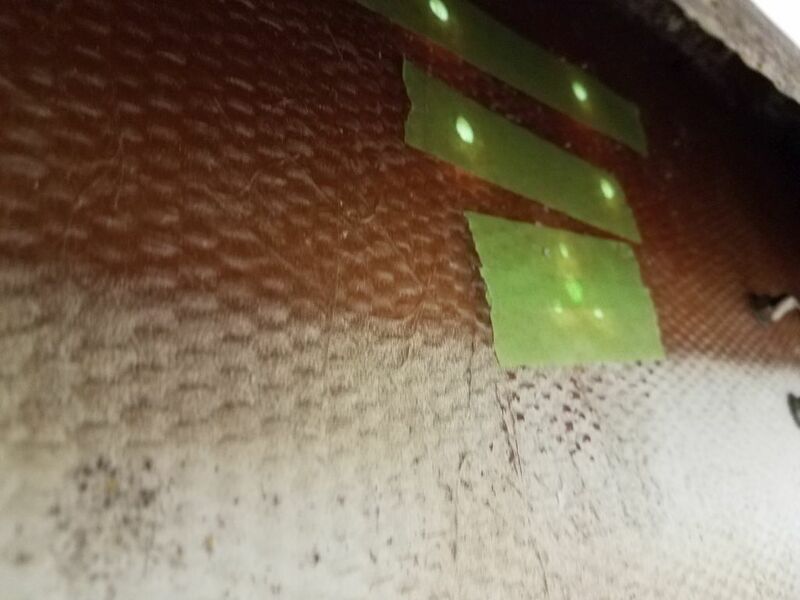 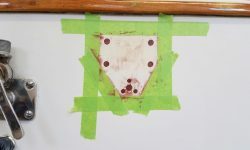 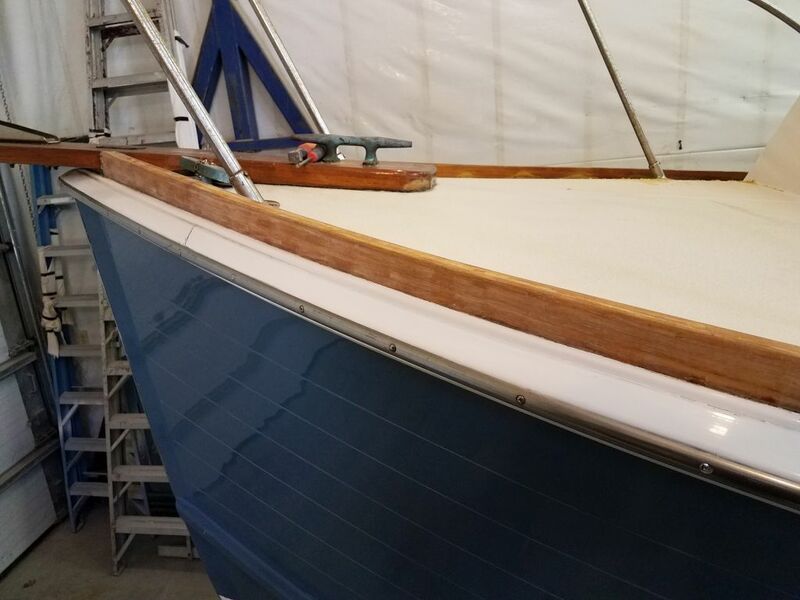 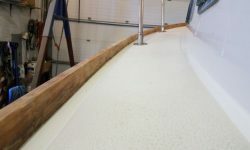 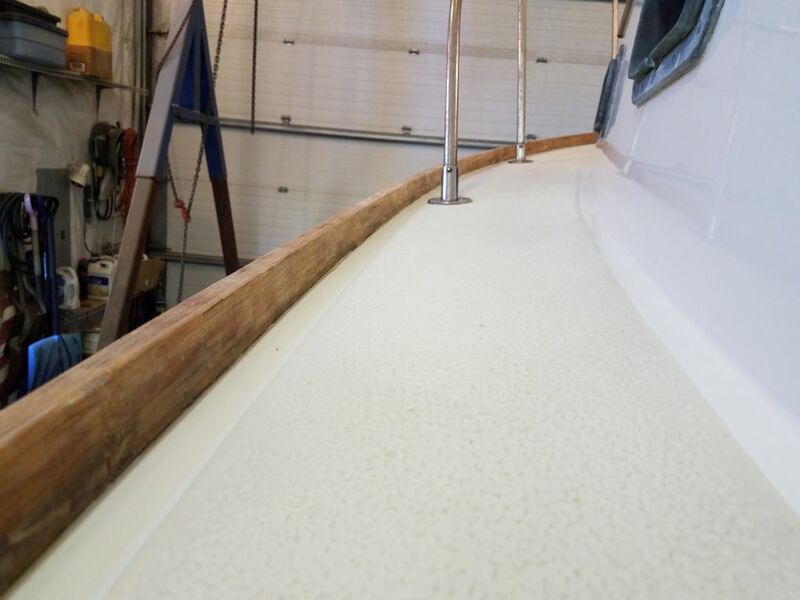 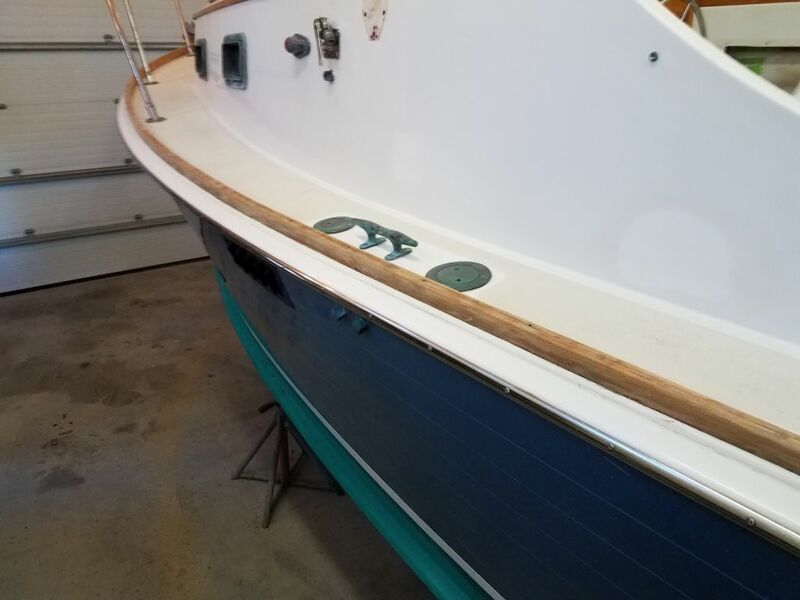 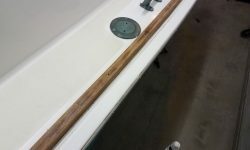 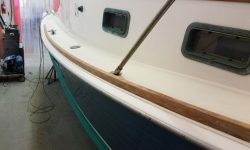 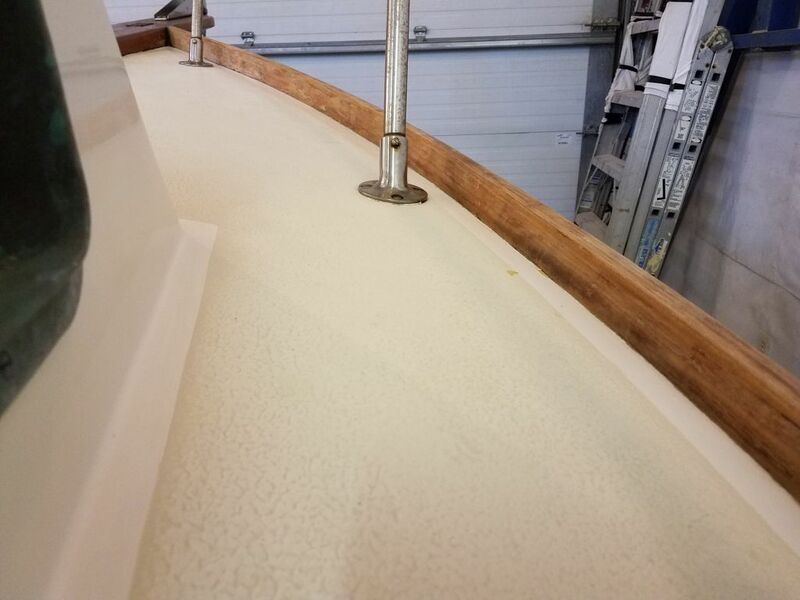 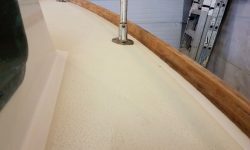 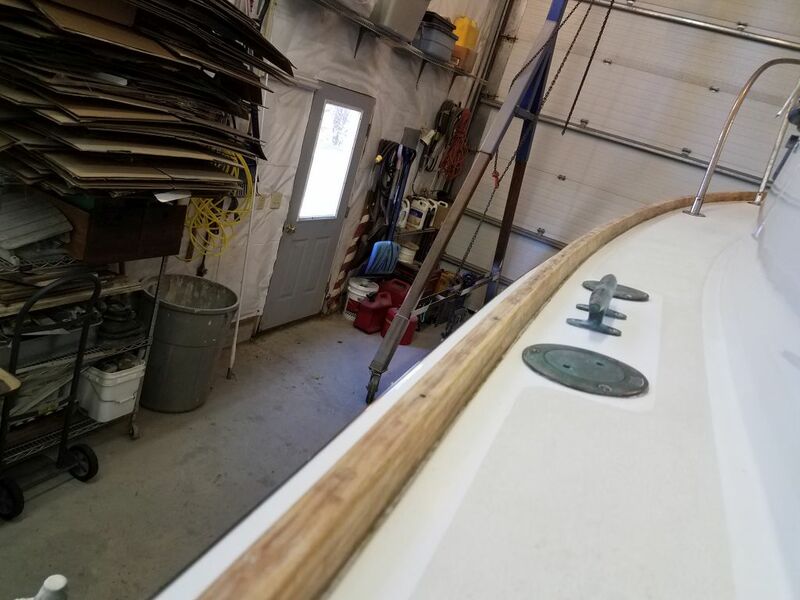 The eventual gelcoat repair would cover these entire areas and more, so I wasn’t worried about epoxy in the field between the holes–and most of that would get sanded off later anyway. 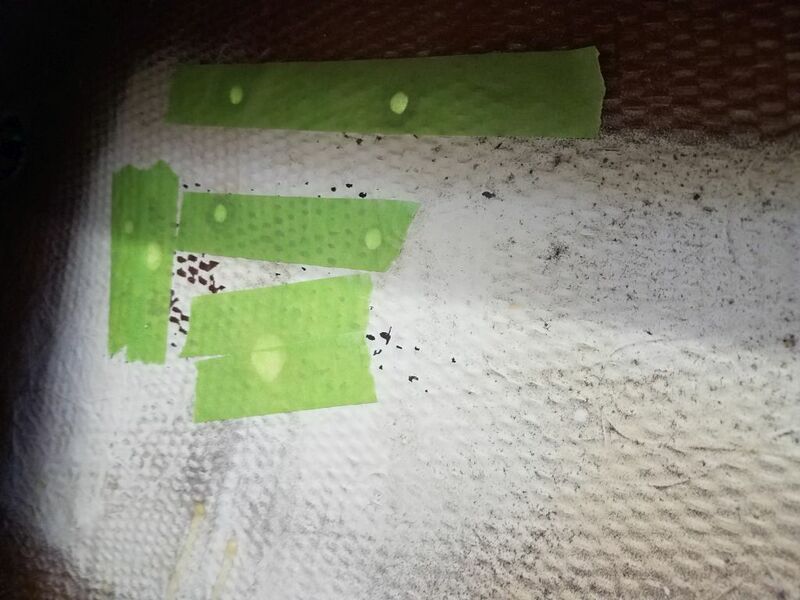 I’d probably need a second application of filler later, but for now I moved on. 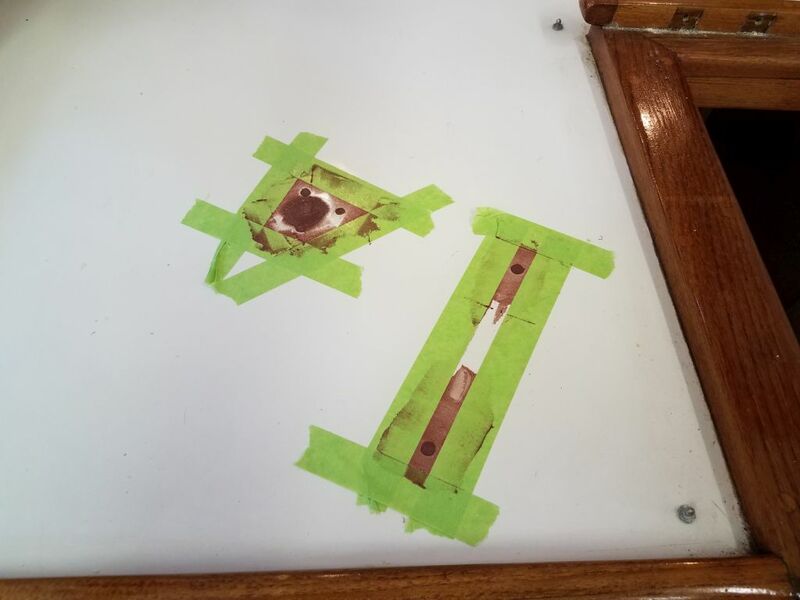 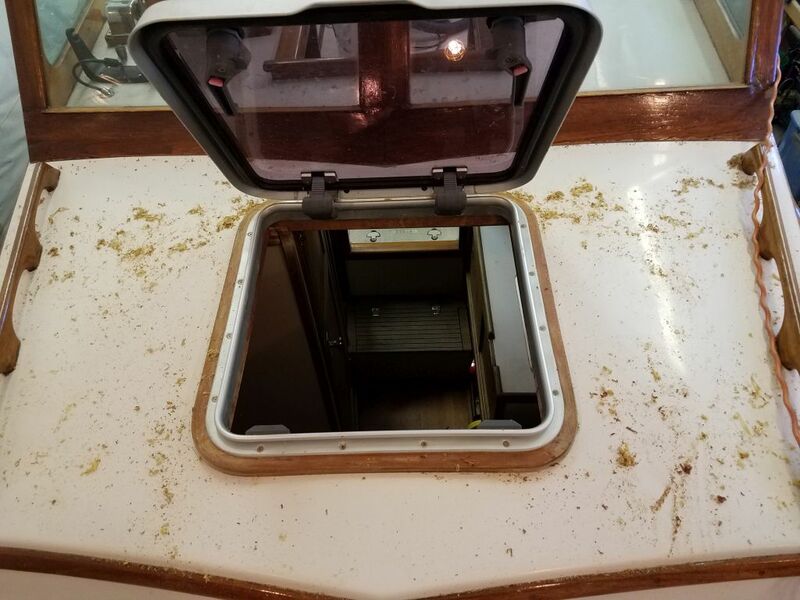 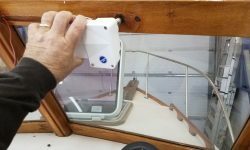 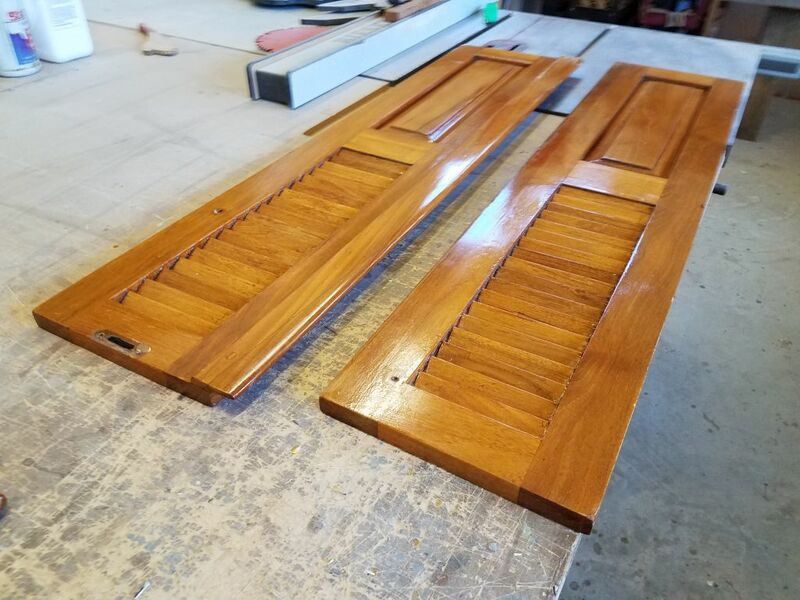 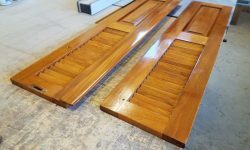 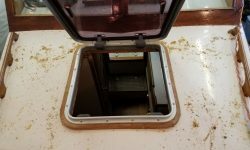 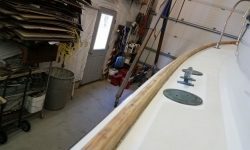 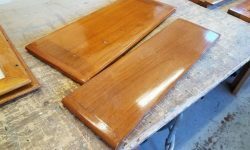 Preparing for the varnish maintenance ahead, I removed the remaining hardware and hinges from the companionway top and doors, separating the pieces for best access for sanding and varnish. 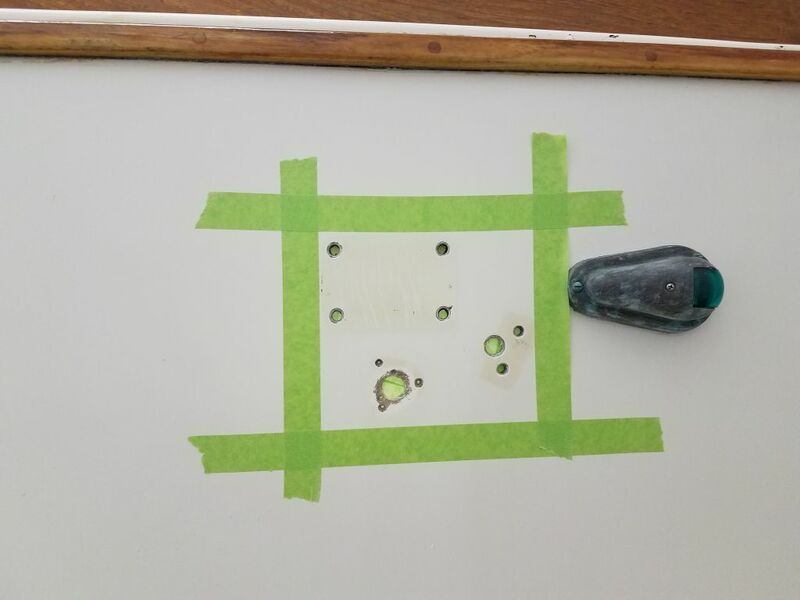 Each assembly had two sets of hinges, plus various knobs, hooks, and snaps, so there was quite a bit to disassemble. 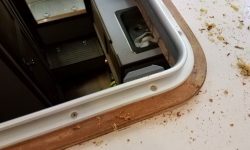 Next, I got set up with tools and power cords for some brightwork stripping, starting with the hatch surround on the coachroof, which I’d built and installed some years ago. 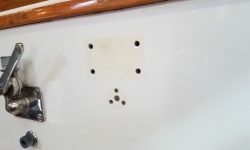 The old varnish here was in poor condition. 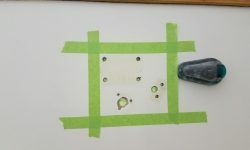 With heat gun and scrapers, I removed the old finish; sanding would come later. 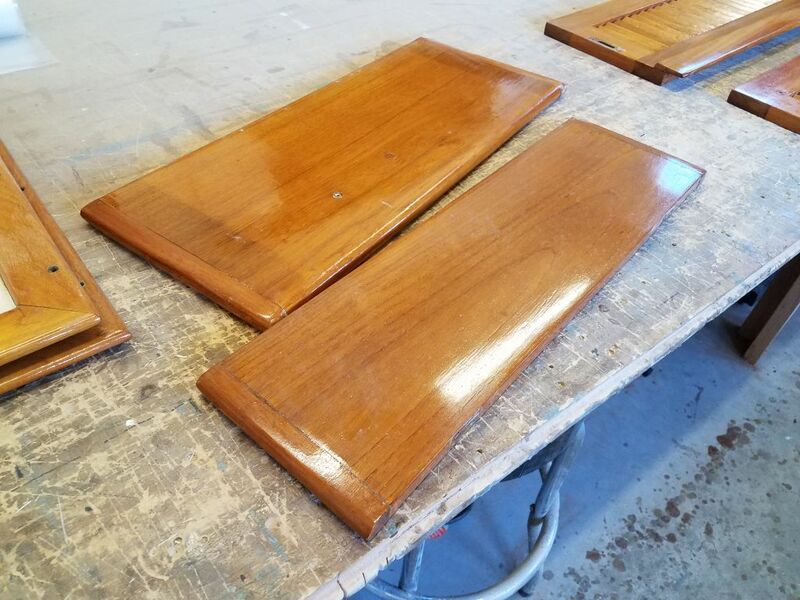 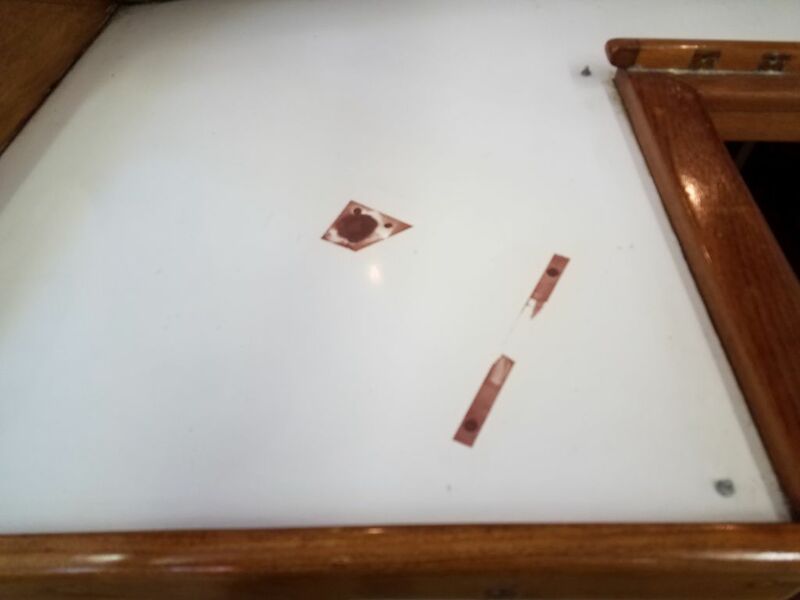 While I was in the area, I stripped two small horizontal trim pieces at the bases of the main windshield panels, as these sun-facing trims had suffered from their exposure. 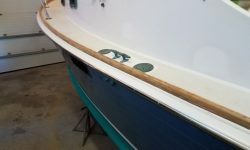 The remainder of the windshield assembly would get a heavy sanding and multiple coats of fresh varnish, but didn’t require stripping at this time. 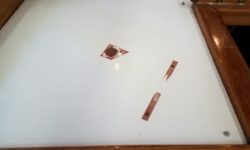 Afterwards, I stripped the two toerails, which ran from the stem to just aft of amidships on each side. 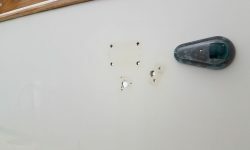 The old finish had failed in several places from water infiltration.